Satsvarupa : In Madras, Srila Prabhupada met with V. Raj Gopala Acarya (Rajaji), who had been India's first chief executive after independence. A friend of Mahatma Gandhi, Rajaji was high in the public sentiment as a religious politician. 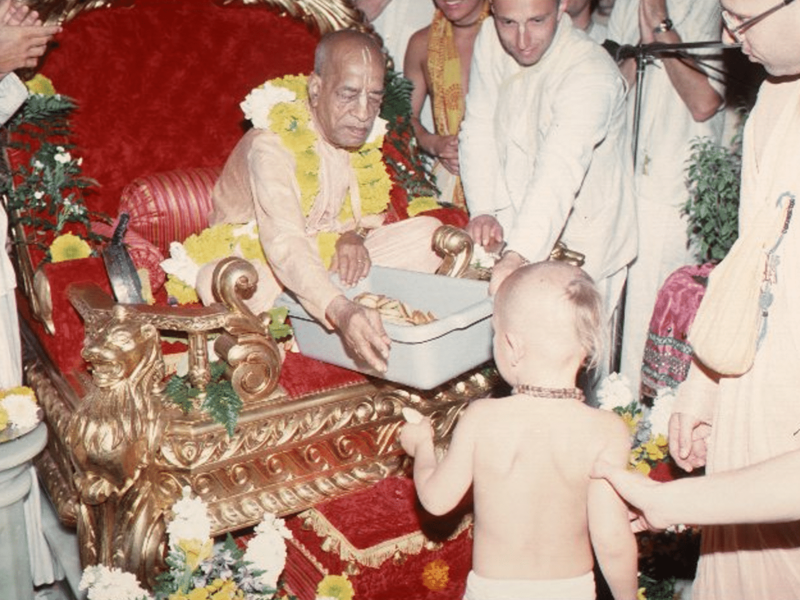 Although in his nineties, he was alert and very sympathetic to Prabhupada's movement. Rajaji expressed only one doubt: Prabhupada had created such a huge institution that now his disciples might identify with the institution rather than with Krishna. If that were to happen, then by identifying with the institution they would again fall into the same type of materialism or false identification as before. Prabhupada replied that because Krishna is absolute, Krishna and Krishna's institution are nondifferent. To identify with Krishna's institution was to identify with Krishna directly. Rajaji was satisfied by Prabhupada's answer, and after a pleasant conversation the two friends parted. American government is good organization. Offered the latest volume of Srimad-Bhagavatam.